This is one of the most remarkable stones in Sweden as it contains a poem written in ‘drottkvätt’ (poem to a chieftain) – a special verse form. This is the only poem surviving in it’s original form. It tells of a ‘King of the sea strong in battle’ named Sibbe who has died. He is likened to Odin, the foremost Scandinavian god. 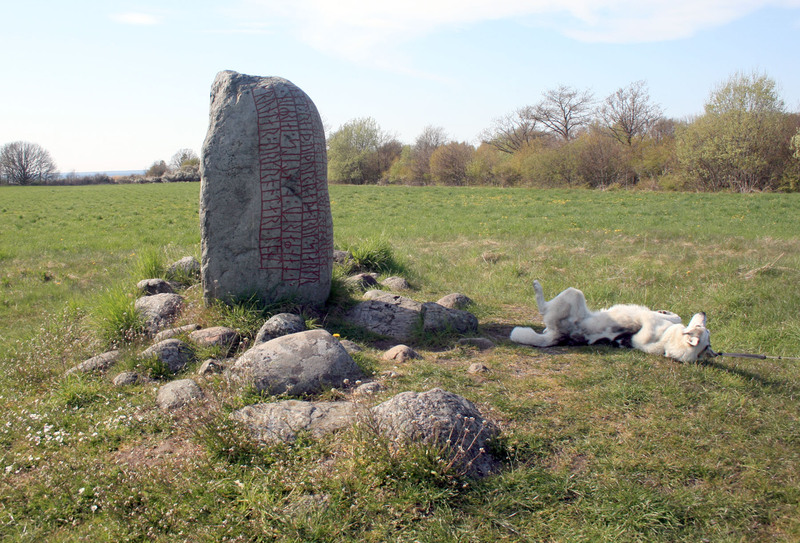 Sibbe was probably a chieftain in Öland and the stone was raised on his property though it did not originate from Öland. The rock type is found only on the other side of the straights on the mainland. The carving dates back to around 1000 AD and was raised at a time of transition between the pagan gods and Christianity. One the back of the stone has been carved ‘Nonin…Eh’, a corrupted form of ‘In Nomine Ihesu’ (In Jesus’ name).